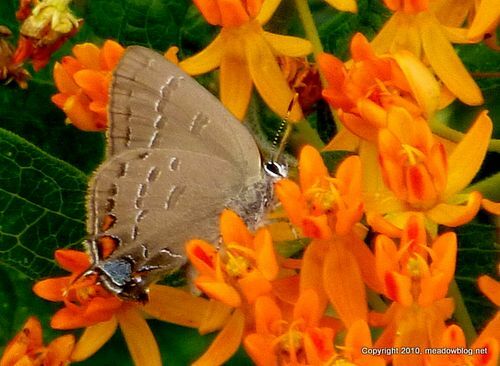 For those keeping score at home, we saw this Banded Hairstreak on the Butterfly Weed at the Jill Ann Ziemkiewicz Butterfly Garden last Thursday. Naturally, we were carrying the wrong lens to photograph it properly. We'll try to get a better shot and (if space allows) add it to the next printing of our new DeKorte Butterfly Guide. More on this butterfly here. Also: We had our first DeKorte Monarch on Monday.